Action DFV must occur before SAP Load for all MMR_NBR instances. I want to extract the SAP Load instances that do NOT have a DFV action occurred before. I am using sqldf in R and I know that R uses SQLite database language so window functions are limited. I managed to get the records, but I am looking to see if there is a simpler and better way to write this with either a SQL query or any R package such as dplyr. "8/23/2018 12:26:20 PM", "8/23/2018 2:38:59 PM", "8/23/2018 2:39:19 PM"
"K00625", "K00632", "K00642", "K00646", "W00362", "W00364", "W00365"
in the above sample data 8/14/2018 11:22:18 AM W00364 SAP Load must be returned along with similar records as the result of the query. sql="SELECT DISTINCT Timestamp, MMR_NBR, Action FROM df5 WHERE (Action='DFV' OR Action='SAP Load') AND MMR_NBR<>''"
sql="SELECT MMR_NBR,Action, COUNT(*) FROM df5 GROUP BY MMR_NBR HAVING COUNT(*)=1"
Assume we have a table for movies (title, year, director, genre) that title and year are identity. Why for find repeated titles this query is wrong? I'm very new at R and EEG signalling so please excuse me if the answer to the question is obvious. I'm trying to perform a Butterworth filter to an EEG signal to extract the Alpha band. When I executed the filter, the resulting signal looked very strange and not at all what I expected, with an unusually large peak at the beginning of the time frame. I tried using eegfilter and bwfilter to see if it was a problem with the code but there was very little difference between the two when I plot the results. I'm at a loss to explain the end result and would be grateful if someone could explain peculiar end result to me. The sampling rate is 512. I want to build a generator function to input Image Data together with the corresponding metadata. There are more than 20 k Images and that is why I can't just read them in to memory. I have tried also to use flow_from_dataframe but in the multi-input case it's getting complicated. The Question is related to Create a mixed data generator (images,csv) in keras. So I am basically trying out the ggiraph() package, and I want to build a stacked bar chart with tooltips that indicate the proportion of each category. I have successfully created the required chart with basic ggplot2 commands, and I have managed to get plotly to work (although the proportion it displays are in decimal format). However, I would like to see how this can be achieved with geom_bar_interactive and tooltip instead. No extra coding required, plotly automatically includes a tooltip for the proportions etc. However, I would like to replicate the same thing but with ggiraph. So far I am unsure what should be included as the tooltip? any suggestions on how to include the actual proportions in the tooltip would be very helpful! I'm trying to replace a placeholder string inside a selection of 10 random records with a random string (a name) taken from another table, using only sqlite statements. i've done a subquery in order to replace() of the placeholder with the results of a subquery. I thought that each subquery loaded a random name from the names table, but i've found that it's not the case and each placeholder is replaced with the same string. I was expecting for each row of the SELECT to have different random replacement every time the subquery is invoked. I'm not sure it can be done inside sqlite or if i have to do it in php over two different database queries. I have a problem to validate data after insert it. And I don't know about insert data is the code is working or not. I have try using Cursor, but I don't know where is error. // `id` and `timestamp` will be inserted automatically. I am trying to get an Email Address for the user where person has watch certain number of movies. For Example If the user had watched movie 1,2, and 3 when I run a query for movie 3 that user should show up in my table. But When User Has match all the criteria like when I run a query for user watch movie 1,2,3 and 4 that user should not show up. But some how the both User 1 and User 2 is showing up, but it needed only User 1 on the list. I have three columns: Sender, Receiver, # of Text Messages. I need to condense the rows by getting the average of two columns. 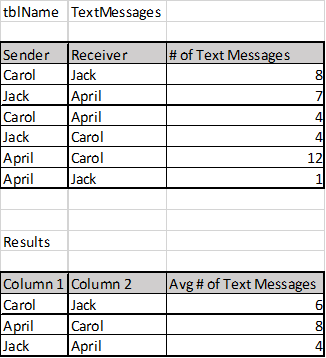 So let's say Carol sends Jack 8 text messages, and Jack sends Carol 4 text messages, the result would be 6 messages between these two people. See image below for better description. My goal is to create a list with each element containing a dataframe. The dataframes are created by calling sqldf iteratively. I have a vector names containing the names of my list. The list is called L, and is of length length(names). Similarly, the second element L$world is created by replacing "'hello'" in that function call with "'world'". However, this is a big problem if I have a lot of names. The problem is definitely in the third line in the for loop where I have the names='names[names == i]' argument. How would I amend this? I think it boils down to: How do I "paste" a string into a function call? if I have a variable x where x <- "hello", how would I "paste" x into the sqldf function? I am trying to load a data set in R which has USERID and Date. I am trying to pull the MIN(DATE) for the userID using sqldf but seem to have a problem with the result. But I get the wrong date and also the wrong format as a result.